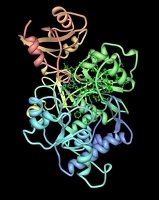 Proteins are the workhorses of biological processes. Because the origins of many diseases lie in the malfunction of proteins, a better understanding of how proteins behave could lead to new discoveries in medicine. At the National Institute for Mathematical and Biological Synthesis (NIMBioS), postdoctoral fellow Yi Mao develops mathematical theories and algorithms to analyze bio-molecular systems, such as proteins. The central goal of Mao's research is to develop a deep understanding of the relationship between the structure and function of proteins. Ultimately, research into understanding protein function could help scientists design proteins with particular properties, which would be useful in developing new medicines and combating diseases. Another important aspect of Mao's research is to understand how energy is propagated by and between proteins. The fundamental building units of biological systems, some proteins are important in the storage and extraction of energy in cells. "Over the course of evolution, nature has made some proteins very efficient catalysts for energy generation in living organisms," Mao said. "Protein design refers to manipulating the makeup of these proteins to yield the desired energy output." Mao, who has a Ph.D. in physical chemistry from Northwestern University, uses quantum mechanics, classical mechanics, and other high-level mathematical modeling techniques to conduct her research in multi-scale simulations of biological systems, primarily proteins. Originally from Wuhan, China, Mao was most recently a visiting instructor in the Department of Mathematics at Michigan State University where she earned a Master of Arts in pure mathematics. Mao's interest in conducting research at the interface between mathematics and biology led to her applying to NIMBioS for the postdoctoral fellowship. "The program is unique in many ways," she said, "and provides research freedom, guidance and a lot of collaborative opportunities." The world class computing facilities at UT and Oak Ridge National Laboratory, home to one of the world's fastest supercomputers, also appealed to Mao. "The computing power will provide great aid in studying complex biological systems," she said.